Adjusting the action on a guitar is key to making sure that it sounds as good as it did the day you got it. The action is how a guitar plays, specifically the distance of the strings to the fingerboard. If the strings sit too high, they’re hard to fret; if they’re too low, buzzing occurs. If the strings are too high or too low, you have to adjust the action. To adjust the action, you need to raise or lower a part of the bridge known as the saddles (the parts just in front of the bridge where the strings sit). You raise or lower the saddle by turning the hex screws with a tine hex wrench. Turn the screw clockwise to raise the saddle; turn it counter-clockwise to lower the saddle. If the saddle has two hex screws, be sure to turn them the same amount so that the saddle stays level. The following figure shows the location of the hex screws. You can also use the saddles to adjust the intonation of your guitar. Intonation refers to the accuracy of the pitches produced by fretting. For example, if you play the twelfth fret, the resulting note should be exactly an octave higher than the open string. If the twelfth fret note is slightly higher than an octave, your string is fretting sharp; if the twelfth fret note is slightly lower than an octave, the string is fretting flat. You can correct a string’s intonation by moving the saddle away from the nut if the string frets sharp and toward the nut if the string frets flat. Different bridges have different methods for this. 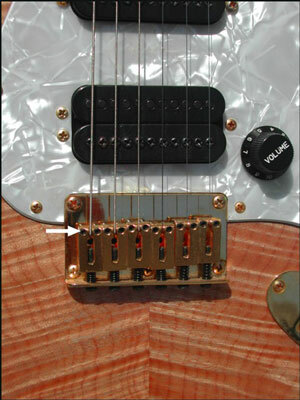 For example, in one common mechanism (used on Fender Stratocasters and Telecasters), screws at the back of the bridge determine the saddle front-to-back position. If you look at the bridge assembly carefully, it should be pretty obvious where to make the adjustment. To correct a string that frets sharp, turn the screw clockwise (with a simple Phillips or flat-head screwdriver — being careful not to ding the top with the handle as you turn the screw) to pull the saddle back toward the bridge. To correct a string that frets flat, turn the screw counter-clockwise to move the saddle toward the nut. Keep in mind that adjusting the saddle for a string corrects only that string. You must perform intonation adjustments for each string. Put on brand-new strings before you adjust the intonation. Old strings often fret sharp and don’t give you a true reading of your intonation.